Peak is versatile and largely intuitive, with a unique sound that excels at dark, trippy, grainy electronica and FX. A worthy flagship for Novation’s synth line. Very well built with hands-on control in all the right places. Has a sound of its own, with a nicely textured analogue filter and plenty of modulation and shaping options. Doesn’t have a keyboard and not rackmountable. Back when analogue synths were well out of fashion, Novation was breaking the mould with its original two-octave, preset-free Bass Station (1993), which found its way into many home and pro studios. Following on from the keyboard version came the very popular rackmount, with preset storage and the same fat analogue sound. It feels crazy that it took Novation 20 years to come up with the follow-up Bass Station 2, but during that time it brought many other great digital synths to the table too, including the popular and versatile Nova series instruments. What we haven’t seen until now is Novation building on both its digital and analogue heritage, and so today we welcome its new hybrid flagship synth, Peak. 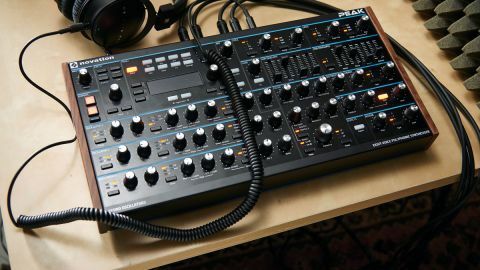 Designed in consultation with Chris Hugget (Chris designed the legendary OSCar and collaborated on several other Novation synths), Peak is Novation’s current flagship synth - and also its most expensive at £1,249. Currently in desktop form only, Peak certainly feels like a high-end product with its super-tight rubberised knobs, good-quality faders (though there is some wobble), reassuringly clicky buttons, weighty metal case with wooden sides, and clear, easy to read OLED screen with adjustable brightness. There’s also a lovely looking stand available for £99, which places Peak in a very handy upright position, though unfortunately Peak’s not rackmountable (it would actually fit nicely in a rack with rack ears but then the outputs are in the wrong place). Whilst Peak is heavy for a desktop synth, it’s still transportable, though it’s pretty wide. Currently there is no official Peak bag but we’re guessing that’s on the cards as no doubt a lot of folks will want to take Peak out to gigs or studio sessions. We do have a couple of further minor criticisms as far as the hardware goes. Firstly, it uses a wall wart, and whilst we don’t really mind this, (though a proper IEC connector would have been better), there is no hook to secure the power lead to the hardware. Secondly, there are a lot of controls onboard in a small space and it’s sometimes hard to read the panel. We feel that a few different colours would have defined the main areas a little better and made navigation easier. Having said this, the panel is largely intuitive, with all the main controls right under your fingers, and deeper parameter editing is done via the simple menus. The screen is also easy to read and navigate, helped by the data entry dial to the right, page buttons underneath and three row selector buttons on the left. Peak is an 8-voice polyphonic, 24 ‘Oxford’ oscillator, monotimbral synthesizer, utilising extremely high resolution anti-aliasing digital oscillators (NCOs) along with wavetables as its main sound sources. Each of the three oscillators onboard offers up the expected analogue-style waveforms (the saw has a density mode, effectively giving you a ‘supersaw’ mode), plus 17 wavetables giving a vast range of tonal possibilities. What’s great is that all the wave types onboard have variable shapes (per oscillator), so one oscillator with some LFO or envelope-driven shape modulation can give you a lot of sonic mileage; (oscillator shape can be modulated manually, by an envelope, via an LFO or via all three simultaneously at varying levels). Peak reminds us a little of the Prophet-12 in some ways, though sonically it’s a little more compact and woody sounding in general - in fact it’s pretty similar to a Nord Lead 3 in tonality. Also, similarly to the NL3 (and the P-12) Peak can produce Linear FM sounds via the mod matrix. Filter mod (achieved via Osc 3) also sounds particularly fine, producing some really nice edgy sounds. At the time writing, Novation has updated Peak’s firmware to 1.1, increasing the mod path strength considerably for FM and allowing stacking of the FM mod paths too). Further 1.1 improvements include newly levelled factory patches (to avoid clipping) and master output level attenuation options. On the subject of modulation, Peak has many options available, and all are easy to dial in either from the front panel directly or via the 16-slot modulation matrix (with 17 sources and 37 destinations and depth control). There are two polyphonic audio-rate LFOs per-voice, with low and high rate modes along with two mod envelopes. Each oscillator has LFO 2 hardwired to pitch on the front panel (for ease of setup) or you can dive deeper into the mod matrix for further assignments/re-routing. Whilst there’s some scrolling involved for assigning and deeper parameter control editing (mainly between pages), it’s all kept to a minimum and it’s easy to dial in parameter changes with the three row select buttons, page buttons and data dial. The mod matrix itself is a breeze to use, and in addition to those 16 slots per sound, there are two sources and a single destination per slot, ensuring that you can make deep and complex effects for moving and evolving sounds. There are plenty of further mod options on the front panel too. As well as Envelope 1 (amp) you have two further assignable mod envelopes (Mod Env 1 is wired to Filter on the front panel), but hit the Select button and you can access a second mod envelope and assign it to any one or more of the 37 destinations. Notably, these digital envelopes sound nicely snappy and detailed, which really aids in the creation of some really punchy bass, drum and percussion sounds, and coupled with the analogue filters and VCA, (plus all the distortion and overdrive stages and effects), you can get some very growly, analogue-like pads and leads happening, along with some altogether more modern, perhaps even futuristic, creations. Filter-wise, there’s one statevariable self-oscillating (in all modes) OTA filter per-voice, with 12/24dB slopes and LP/HP/BP modes. Handily, there’s also pre/post filter overdrive available too, so you can really control whereabouts in the signal path the grit occurs (much like in Arturia’s MatrixBrute) and consequently, several different flavours of distortion are available. Notably, the filters’ character is smooth at lower resonance, but it can get really spiky and gritty in an almost Oberheim-ish or Memorymoog-like way at higher resonance (especially when modulated), giving plenty of sonic sweet spots and wide tonal variation. You take three oscillators, tweak them, detune them, but then what?! Peak offers up a whole load of treatments to help take your sounds into another dimension. Firstly, there’s ring-mod and cross-mod for adding texture and making metallic tones. Then there’s shape mod, oscillator sync and filter and linear FM. As the filter has such powerful resonant characteristics, you can achieve some extremely piercing, glassy and liquidy tones too (12dB mode allows more highs to cut through whilst 24dB mode is smoother - both are great). Also, as the resonance tracks the keyboard range perfectly, it’s great for making precise kicks, other drum sounds and FX. Add a little reverb and delay, some noise and distortion for grain and you’re in heaven! Notably, the onboard reverb is simply one of the nicest digital reverbs we’ve heard in a synth in a long while, and we suspect will become a huge part of the recognisable Peak sound (as you tend to want to put it on everything). Last but not least, the polyphonic-capable arpeggiator has plenty of patterns/rhythms for variation and also sends out MIDI, so Peak can be a useful hub for arpeggiating other gear in your studio. Unfortunately, there’s no audio input to route external sources through these lovely filters and the effects (and you can’t modulate the effects as on the DeepMind 12), but perhaps FX modulation could be added via a firmware upgrade. One other cool feature is filter divergence, (like DSI’s ‘slop'), which ages the filters and sends them out of calibration, and you can do this for the oscillators separately too, along with drift - perfect for more vintage tones. In terms of performing and getting hands-on with Peak, it’s well qualified. We really dig the two assignable ‘animate’ modulation buttons (like the Morph buttons on the Nord Lead 4), and these can be used to inject subtle or more crazy modulations into your sounds on the fly. As expected, most controls send and receive MIDI commands, and most parameters you’d want to use in a live performance context are also under direct hands-on control. It’s great having all the onboard effects under direct control so you can really spin your sounds out using the delay, put them in some gorgeous spaces using the deliciously long reverb or make things sound lush and bubbly using the chorus - in fact all the FX are excellent, complementing the oscillators perfectly. Also worth mentioning is that Peak has some other essentials onboard, including a great poly-arpeggiator, unison spread, Vsync (sync using one oscillator) and also there’s the expected unison and mono-legato modes too, with poly glide. To conclude, Peak is deserved of its flagship status. It has a lot in the way of sonic shaping, a unique and huge tone palette suitable for all styles of electronica, plenty of hands-on control, plus it’s well-built and fairly priced too. Importantly, everything runs reliably and it straight-up sounds great; kudos to Novation on another impressive machine!